“I am not a part of your Machine” shirts available! Triangle Chance for All is excited to announce a partnership with The Ghosts in Our Machine to bring you an exclusive shirt! 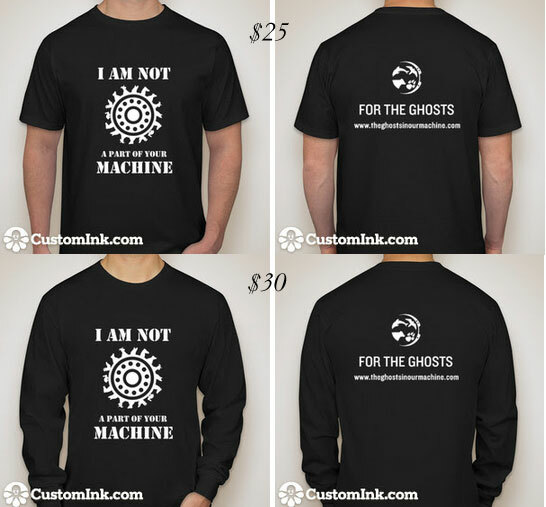 Available in short and long sleeves, the shirt features the signature Ghosts cog by Michele Gorham, along with the text “I am not a part of your machine,” which is from TCA President Justin Van Kleeck’s poem “The Iowa Dirge.” The back features “For the ghosts” with a link to the film’s website. We will take pre-orders until Sunday, June 15th; please order yours early to help us cover costs of the initial order! ALSO, we would like to let everyone know that Triangle Chance for All will be presenting the North Carolina premiere of The Ghosts in Our Machine on Tuesday, September 16, 2014! The FREE screening will be part of Vegan Night Out, which will include special vegan dining options and the film screening in downtown Chapel Hill. Stay tuned for more details about the event, but mark your calendar now! Please show your support for TCA and for the ghosts! Please use this form to order your splendid Triangle Chance for All T-shirt! Now you can wear your support for Triangle Chance for All with our new logo T-shirts! The shirts are made from organic cotton and come in men’s (pictured here) and women’s styles, sizes S to XL. Just fill out the order form below, and then click the Donate button and enter $25.00 per shirt ordered. If you need your T-shirt shipped to you, please add $6.50 for shipping and handling.